Ryan Barone serves as Assistant Vice President for Student Success at Colorado State University. 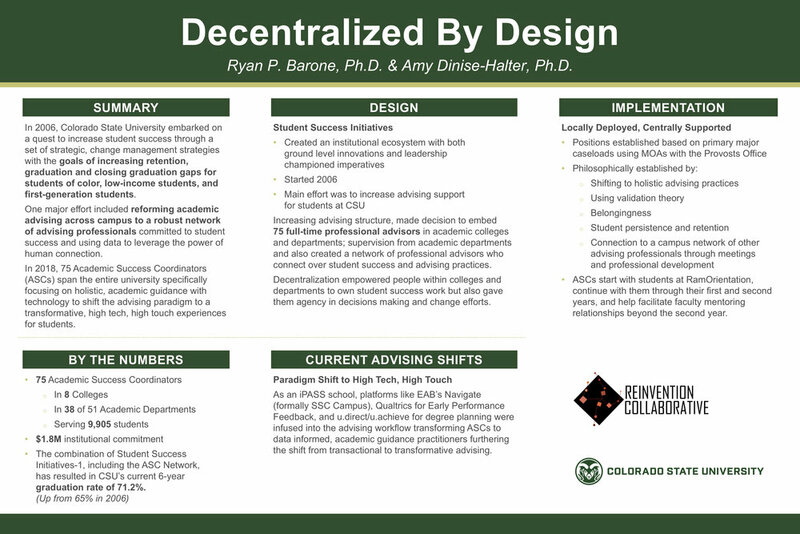 In this role, Barone leads the academic cluster in student affairs consisting of student success projects staff, the Career Center, the Academic Advancement Center, the Colorado Challenge, and The Collaborative for Student Achievement. He also provides leadership in the development and implementation of the University’s student success initiatives, working collaboratively with Academic Affairs and Student Affairs. He received his PhD in Higher Education from the University of Denver in 2014 with a specialization in Diversity and Higher Learning. Dr. Amy Dinise-Halter is an Assistant Professor in the Student Affairs and Higher Education program and serves as the Student Success Manager at Colorado State University. In this dual appointment, Amy serves as a thought leader and contributor to CSU’s Student Success Initiatives by overseeing the Academic Success Coordinator Network and working with Student Success technologies. In the classroom, Amy teaches the Student Affairs and Higher Education MOOC (Massive Open Online Course), Capstone in Student Affairs and Higher Education, and Program Evaluation. Dr. Dinise-Halter’s research agenda focuses on student affairs new professional identity development, and student success research including academic guidance, high impact practices, and persistence and graduation gaps. Amy earned her Ph.D. from the University of Northern Colorado in Higher Education and Student Affairs Leadership with a minor in Applied Statistics and Research Methods; her master’s degree in Higher Education and Student Affairs from Indiana University; and her undergraduate degree in Liberal Studies from Cal State Fullerton.